The Last Jedi picks up pretty much where The Force Awakens ended, with Rey (Daisy Ridley) having located Luke Skywalker's (Mark Hamill) whereabouts and with the rest of the Rebel fleet fleeing the The First Order after having destroyed Starkiller Base. Similarly to Force Awakens, Episode VIII's story lines echo some of those seen earlier in the franchise. Particularly Rey trying to convince an older, solitary Luke to train her in the ways of the Jedi just as Luke did with Obi-Wan many years before, and with Luke refusing for virtually the same reasons Obi-Wan didn't want to train him. But just as with Force Awakens, the echoes and homages in story points are handled well in my opinion. Writer/Director Rian Johnson takes the franchise reigns from J.J. Abrams and adds an entertaining (if uneven) chapter to the Star Wars universe. We see some really good character development throughout The Last Jedi. Rey, Kylo Ren (Adam Driver), and Poe Dameron (Oscar Isaac) in particular end up in very different places than where they began. At the same time though, we also see a main character who doesn't really seem to progress at all in Finn (John Boyega), and a few others who feel under-utilized or don't even come close to filling their potential for the franchise: JD (Benicio Del Toro), Snoke (Andy Serkis), and Captain Phasma (Gwendoline Christie). To be fair, I felt like these characters got the short end of the stick when it came to the script, not in that they were poorly acted. JD did seem like he could have played by virtually anyone though. I don't think they utilized Del Toro's talents to the fullest. We are also introduced to a couple new and important (to this chapter) characters: Laura Dern's Vice Admiral Holdo and Kelly Marie Tran's Rose Tico. I really enjoyed what Holdo brought to the film, particularly her relationship with Poe, and Rose grew on me the second time I saw this film. Personally, I loved the role that old Luke played. It was great to see Mark Hamill really get back into the character after being used only as a teaser at the end of The Force Awakens. Best of all though, we get one final performance from Carrie Fisher as Leia, continuing to be a leader to the Rebel forces and imparting wisdom on those who will become her successors. All in all I really enjoyed Star Wars: The Last Jedi. There was one quick scene that felt a little out of character to me, but I'll touch on that in the spoiler section below. Other than that it was a lot of fun. I laughed out loud on a number of occasions and teared up on a couple of others. From what I've seen online, this entry to the franchise seems to be either love it or hate it. 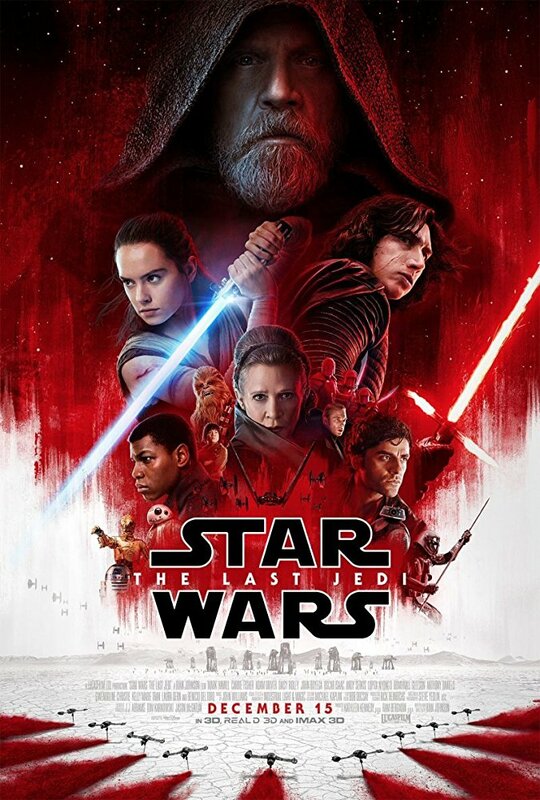 I don't know that I would go so far as to say I loved it, but I did enjoy it enough to go twice on opening weekend and I think that most people who enjoyed The Force Awakens will like this film as well. If you need a break from either your last minute shopping or the crazy house full of relatives this weekend, at two and a half hours long (plus trailers) Star Wars: The Last Jedi should provide a nice reprieve. Happy Holidays! - There are no post film scenes, but if you wait through the first wave of credits, a nice dedication to Carrie Fisher can be seen. It happens pretty early though, so pay attention for just a minute and you'll see it! I actually missed it the first time I saw this because I was checking messages on my phone. - The scene in which General Leia and Vice Admiral Holdo start to tell each other "May the Force be with you" made me tear up. You could tell that it wasn't just Laura Dern saying those words to Carrie Fisher in character, but as herself and as every other actress who grew up watching Fisher in the role of Leia (Dern was ten when the original Star Wars came out in 1977). - The part that still feels off to me after two viewings was Leia's using the Force to will her way back to the ship after the bridge had been blown up and she had been sucked out into space. We know that she has a connection to the Force, but it has never been shown to be THAT strong in the films and it just felt off. I've been told that some of the extended universe stories explored her powers/use of the Force in the novels/comics so it wasn't completely out of character. I wasn't aware of this so it just felt weird to me. I totally get why they 'took her off the board' for the narrative being told - it allowed the struggle between Holdo and Poe and led to Poe's very important character growth - but they could have just as easily done it by having her severely injured during the attack as opposed to amping up her powers. - Lupita Nyong'o's Maz Kanata appears in a scene via holographic communicator, suggesting that Poe/Finn/Rose seek out the Master Codebreaker. - I could have done with less of the Finn and Rose in search of the Master Codebreaker side story. It was important but felt like it made the film drag a little bit. - I didn't mention him in the body of the main review, but I have enjoyed Domhnall Gleeson's General Hux. I feel like he has been an under-rated addition to the last two films. He and Driver playing off of each other as Kylo and Hux and their struggle for leadership within The First Order is quite good. - Speaking of Driver, I really like what he is doing with Kylo Ren. I feel like he is quickly becoming one of the more intriguing characters in the franchise. - This is the first Star Wars film in which Peter Mayhew did not physically play Chewbacca. He is credited as being a consultant on The Last Jedi, while Joonas Suotamo wore the Chewbacca costume this time around. - Carrie Fisher's daughter Billie Lourd returned in her roll as Lieutenant Connix, this time playing a larger role than in The Force Awakens. - Star Wars veterans Anthony Daniels (C-3PO), and Frank Oz (Yoda) return to their classic roles as well.